CRI Alerts have only been used by gardaí on six occasions since their introduction. These alerts will appear on the newsfeeds of all 2.8 million Irish users. 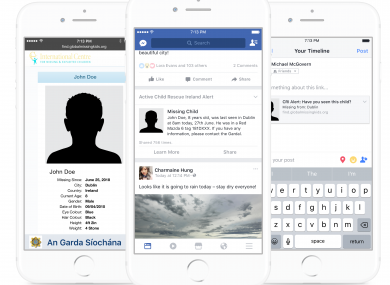 FACEBOOK WILL DISTRIBUTE alerts on the newsfeeds of Irish users when a child has been abducted and gardaí believe they at serious risk, it was announced today. Child Rescue Ireland Alerts have been used by An Garda Síochána since 2012 to get information to members of the public when they have concern about a child. They have only been used six times since their introduction. In the past, the organisation has used traditional media to get the message out and in recent years they have also used online platforms like their own Twitter and Facebook profiles. This morning a new CRI Alert partnership between An Garda Síochána and Facebook was launched. The organisation said the expansion of the programme will give people “an instant way to share important information about the missing child and suspected abductor such as a photo, hair colour and clothes, with their friends and family and community group”. There are a number of criteria a case must meet before an alert is sent. There must be sufficient information available to enable the public to assist An Garda Síochána in locating the child. A senior garda member will assess whether these criteria have been met. Assistant Commissioner Special Crime Operations John O'Driscoll said in situations like a child abduction the one thing that is most important is a speedy response. Under this new partnership, An Garda Síochána will now notify Facebook’s global security operations centre, which operates 24/7 that a verified CRI Alert is active. Facebook will then sent the alert to the newsfeeds of all 2.8 million people in Ireland who have profiles as quickly as possible. Facebook’s trust and safety manager Emily Vacher said the Facebook alert will include a picture of the child and any information the public would need to help find them, like a description of a vehicle connected to their abduction. Email “Facebook to start placing child abduction alerts on Irish users' feeds”. Feedback on “Facebook to start placing child abduction alerts on Irish users' feeds”.